Biodegradable urns and scattering use ritual to celebrate and honor life. These cremation urns breakdown over time, preserving the Earth. Some are designed for land burial and others for scattering over lakes, rivers, or at sea. They are beautiful and popular urns used for scattering ceremonies. 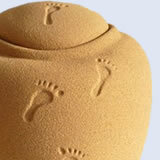 The materials used in the making of our biodegradable urns are non-toxic and environmentally safe. The urns dissolve completely in water in approximately 25 minutes. All are TSA airline compliant.